Do I need to be able to program or even read code? Absolutely NOT. This was designed to give the non-programming trader and money manger the ability to do advanced quantitative analysis. Hopefully, this software can save you the costs of hiring a few quants or programmers. If you choose to do so, you do have the ability to build additional signals with Python and test them alongside the pre built-in Build Alpha signal library, however. This is NOT required to use the software and is just meant as an additional feature. What Markets Are Offered? Is Data Included? Currently almost every futures market – all data is included and continuously updated every week. The major stock indexes such as eMini S&P500, Nasdaq, Dow Jones, Russell, Dax, and the Nikkei. Two, Five, Ten year notes and 30 Year Bond. German 10 year Bund. Corn, Wheat, Soy Bean, Sugar, Lean Hogs, Live Cattle, Coffee, Orange Juice. British Pound, Yen, Euro, Dollar Index, Aussie Dollar, Canadian Dollar, Swiss Franc. Gold, Silver, Copper, WTI Oil, Natural Gas. Now also with major Forex pairs, ETFs and BITCOIN! So No ETFs or Stocks? ETFs are now available! If you are interested in additional and individual stocks please shoot a note. It can be done sooner if there is ample interest. What Time Frames Are Offered? Daily data for as far back as the contract has existed. I am currently working to provide streaming and live data for all timeframes such as 5, 15, 30, and 60 minute charts. You can of course import your own data as well even custom bar types like kase, range, volume based bars. Please view the demo videos to see how. For custom timeframes and temporary solutions please contact david@buildalpha.com. Currently, we can test up 5000+ signals which is close to (5000 choose 4 or) 5000 choose 4 -2.6010428e+13 possibilities per simulation in less than 2 minutes. The less signals the faster the processing time; 50 signals can be tested in mere seconds. Simple price action and technical strategies can be done in a second or less. For example, a simple RSI2 strategy (buy when RSI2 < X and sell when RSI2 > X) can be done in less than 1 second. How Do I Know Build Alpha will create robust strategies? 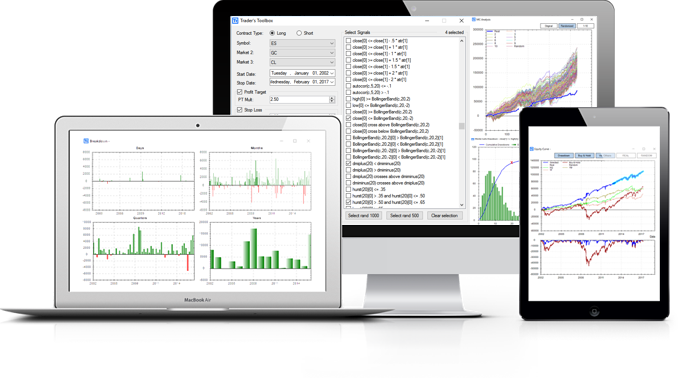 Build Alpha allows users to select out of sample percent, minimum number of trades both in and out of sample, as well as do advanced Monte Carlo drawdown analysis and variance testing. We cannot guarantee future success, but we believe proper testing, advanced tools, and expert analysis provides the best opportunity for success in the future. However, please view our full risk disclosure below. We have also attempted to eliminate curve fitting mistakes by not allowing users to optimize parameters and using many very concrete signals that do not vary based on “lookback” parameters. Additionally, the strategy code results in less than 20 lines of code. These are not overly complex (and easily curve fit) mathematical models, but rather time tested patterns that are objective. How Does Build Alpha attempt to prevent against overfitting? Yes, a large search space or feature set can find great strategies simply by random chance. However, I have implemented and continue to implement ways to prevent against overfitting/curve-fitting or reducing the probability that a great strategy was not found simply by random chance. For example, out of sample testing, requiring a minimum number of out of sample trades are the most obvious ways. Furthermore, we test all systems against a “baseline” which is comprised of signals tested on fake/synthetic data as well as random signals tested on real data. You can also test specific strategies across other markets. Other markets provide valuable “out of sample” data, in a roundabout way. Expect this feature in early 2017 and will be a free upgrade (all upgrades) to all life-time license holders. Finally, Build Alpha only uses a maximum of four rules or less per strategy and all the rules are simple and deterministic. Can Build Alpha Optimize or Stress Test My Strategy? Is Slippage or Commission Included? Yes, the trader/money manager has the ability to enter custom slippage and commissions as I understand many traders have many different commission plans. Do you have a trial or demo version? I am new to system trading. Do you have a course or any documentation? Yes, there is a private user forum and a user guide that comes with every license. You also get access to a 50 plus video course that explains the software from start to finish, highlighting each feature, a few examples, some dos and donts, and much more. From System Trading Basics to an in depth dive. Plenty of complete beginner system traders have picked up Build Alpha immediately. It is designed to work flow step-by-step and the videos will clarify. Do I Need a Specific Broker or Platform? Short answer: No. You can even have fully functioning search capabilities with no internet connection! This is a stand alone product/software that has everything built in. However, Build Alpha does generate fully functional code for TradeStation’s EasyLanguage, MultiChart’s PowerLanguage, NinjaTrader’s C# (both 7 & 8), Python for Quantopian, MetaTrader4 and Pro Real Time. We are actively working on generating code for other brokers as well. However, if not using TradeStation, Multicharts, NinjaTrader, MetaTrader4, Pro Real Time or Quantopian and wish to automate a strategy you have built then please view our consulting page as we offer strategy to code services, as well. Software requirements: MS Windows 7, 8, 10 (x86 or x64); .NET Framework 3.5. Hardware requirements: 400 MB RAM, 20 MB free drive space, 1024×768 display, Internet connection (for updated data). I can help you install a virtual machine that will act as a program that will allow you to run this software on your mac. There are a variety of free and cheap solutions. Please contact if you have questions or would like the process explained further.